This is a standard "simple" RS232 port. This Tibbit is based on a generic RS232 transceiver (we use Zywyn ZT232F). For "normal" RS232 applications, this Tibbit has to be connected to the TX and RX lines of the CPU's UART (see [SER]). Planning to use RTS/CTS flow control as well? An interrupt line must be available, too (see [INT]). You can also combine the RS232 Tibbit with #20 (9 terminal blocks). 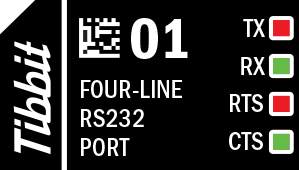 Using #21 (four terminal blocks) is also possible if you can steal the ground elsewhere (#21 doesn't have its own ground line). There are four LEDs: two red and two green. Red LEDs are connected to TX and RTS lines. Green ones are for RX and CTS. All LEDs are buffered (with logic gates) and light up for the LOW state of control lines.